LED light bars at the 38-inch length and above are getting a bit long for mounting on smaller ATVs or UTVs, but are fantastic primary lighting sources for driving, as work lights, for setting up camp or for tow trucks responding to a nighttime emergency. We have chosen two light bars in this less-seen length that are quite different from one another in terms of design, power and quality level. Each will throw an incredibly bright beam with combination flood and spot optics. 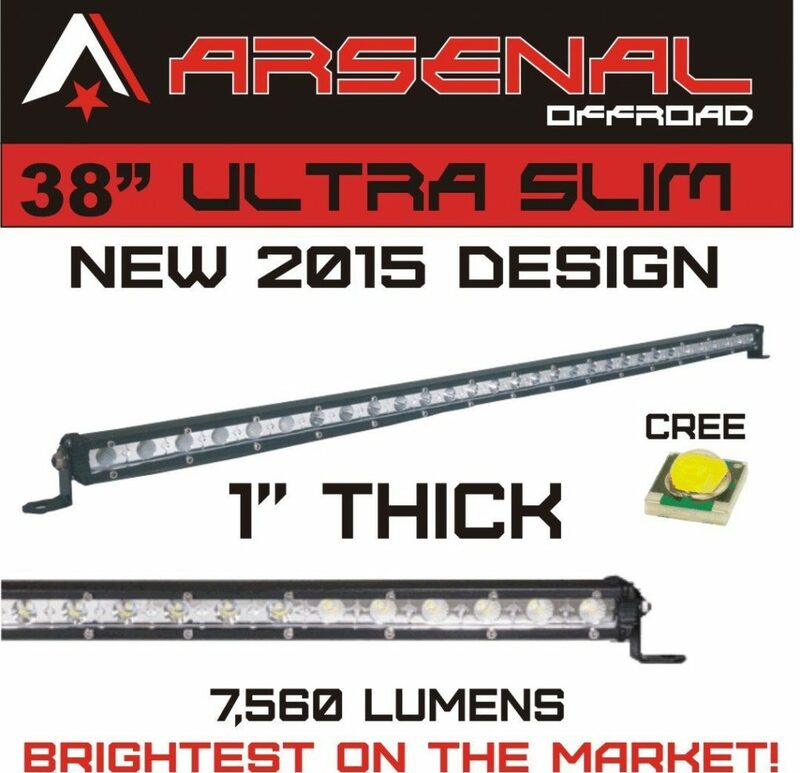 The Arsenal Offroad 38″ light bar is a slim, but powerful light bar. Its 36 high-intensity CREE LEDs are arranged in a single row, which yields a super lightweight, low-profile lighting option. The housing is only one inch high and two inches deep. It easily slips in between the cross members of most grilles or roof racks. This light bar is nearly invisible mounted below the bumper. It outputs over 7,500 raw lumens of intensely bright light via end flood and center spot optics in a 60/30-degree pattern. This light bar is the sleekest, lowest-profile bar we review in the longer lengths. It is barely visible mounted above the windshield and produces very little highway whistle. It is surprisingly light for the amount of light it puts out. The deep-fin, integrated heat sink in the IP67 housing will keep the LEDs running cool throughout their expected 30,000-hour lifespan. Although it is not yet widely reviewed, this light bar has received 5-stars in every review out there. The Arsenal Offroad super-slim, 38-inch light bar is perfect for stealth installations without sacrificing brightness. The low height and low weight provide more mounting options that dual-row light bars. At under $100, it is a super value. Rigid’s entry in the 38-inch light bar category is the crème de la crème in terms of high performance and top quality. This E-Series dual-row flamethrower puts out an astounding 17,480 raw lumens with a spot beam distance of 1,363 meters. It draws 209W with a maximum current of 15.1A. Unlike less expensive light bars using diecast aluminum housings, this one is extruded for extra durability. Along with the shatterproof polycarbonate lens and GORE® pressure vent, it achieves an IP68 intrusion rating. Yes, you pay more for a Rigid light bar, but consider that this is a bar built with a lifetime warranty backing it up. The build and parts quality are top drawer. This light bar outshines anything less. Rigid uses patented hybrid optics that combine both a reflector and lens for each LED. They are famous for their night-shattering brightness and void-free beam pattern. If you want the best in the 38-inch light bar length, then Rigid is the way to go. This light bar is designed, engineered and assembled in their USA plant, so you know it is top quality. It will be the last 38″ light bar you will ever need. In the 38″ light bar class, you have two great choices in either the Arsenal Offroad low-profie, single-row model or Rigid’s dual-row E-Series gloom-buster. Depending on your needs and the dimensions of your mounting position, either of these light bars could fit the bill. Aresnal Offroad’s product is an excellent high-power starter or stealth light or for applications requiring two or more lights on the same vehicle or equipment. When you need a top-of-the-line product made for the most rugged trail and environmental conditions that will outlast your vehicle, 38″ Rigid LED lights are what you seek.